You are evil, I am good. I try to bring you on right path, You try to deviate me from righteous path. We are destined to do it ALWAYS. As I mentioned, I should give up finding logic in your posts. Tum kya kehna chahte ho Please try to think coherently... and then post. It might help. And then libtards in America curse Trump for his utterances against Muslims, the only sane voice in a sea of madmen. There will be 50 million muslims in America by 2030. Last edited by sarv_shaktimaan; January 30th, 2016 at 07:03 PM. a new word will have to be invented for that---like 'amebia' or 'ararica' or something like that . eurabia is for europe not america..
Up to 300,000 refugees will arrive in Germany this year, the head of the country's migration office has said in a newspaper interview. The latest projections were disclosed by Frank-Jürgen Weise in an interview with Bild am Sonntag. The figures emerged as Sigmar Gabriel, Germany's vice chancellor said that Angela Merkel had "underestimated" the challenge of integrating a record migrant influx. Gabriel is also leader of the Social Democrats (SPD) - the junior coalition partner in Merkel's government - and his comments to broadcaster ZDF come as campaigning gets under way for a federal election next year. Concerns about how to integrate them all into German society and the labour market are now rife and support for the anti-immigrant Alternative for Germany (AfD) has grown. so, if even 1% of the these 3 lakh turn out to be terrorists/radicals.. you will have 3000 entering Germany every year. I walked down the street in Barcelona , and suddenly discovered a terrible truth - Europe died in Auschwitz ... We killed six million Jews and replaced them with 20 million Muslims. In Auschwitz we burned a culture, thought, creativity, talent. We destroyed the chosen people, truly chosen, because they produced great and wonderful people who changed the world..
A van has plowed into a crowd of people in Barcelona, killing 13 and injuring more than 50. Local Police have confirmed that the incident was a terror attack and have arrested one man. The number is "bound to rise" according to local officials. 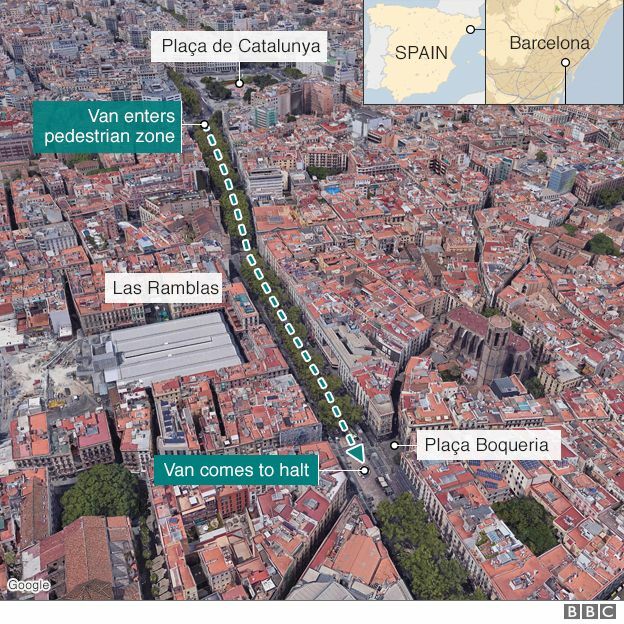 Incident took place near the Las Ramblas area, which is popular with tourists. Police have told people to avoid the area. Catalan emergency services have requested the closure of metro and train stations in the vicinity, according to Reuters. Problem is that people come out and call all sorts of things to people hating Islamic terror. They will create big Tamasha over 1 beaten to death by cow protection gang, or one dead in Charlottesville, or some nonsense spewing rationalist murdered, etc. These same people shy away from calling out the menace that does wholesale killing.